“The mind that perceives the limitation is the limitation” is not a quote from the Buddha. It’s neither in the style of the early Nikāya scriptures (of which the Pali Tipitika/Canon is the best-known example) nor in the style of the later and more literary Mahayana Sutras. The language and phrasing are far too contemporary for this to be from the Buddha. Unfortunately I don’t know the ultimate origin of this quote. So far I haven’t found any instances of it occurring before 2012, which suggests that it is in fact of modern origins. The copyright indicated that “Walter Scott” was the author. This was the pen name of a celebrity gossip columnist called Lloyd Shearer, who wrote “Walter Scott’s Personality Parade” for Parade from 1958 to 1991. The passage I’ve just quoted goes on to say that we should then reflect that we are not alone in being in this existential situation. Contemplating other beings in this way, especially after I’ve connected with the fragility of my own life does, I’ve found, lead to a sense of tenderness and compassion for others. Another faint resonance is with the Buddha’s teaching of the brahmaviharas, or divine abidings. These four qualities embrace: kindness (metta), compassion (karuna), joyful appreciation of the skillful (mudita), and equanimity (upekkha). Lloyd Shearer’s words include tenderness for the young (which could be a way of talking about metta), compassion for the aged (which is karuna), sympathy for the striving (mudita is often talked of as “sympathetic joy,” and tolerance of the weak and wrong (tolerance being a component of upekkha). Perhaps this resemblance is coincidental, or even just in my head, but I can’t help wondering if Shearer had had some exposure to Buddhist teachings. I don’t have much to say about it, unfortunately, because I haven’t yet been able to track its origins. The earliest reference I’ve found on the web dates from November 23, 2006. It’s in several books, but none I’ve found was published prior to 2010, and the words “Buddha is quoted as saying…” are used. I’m fairly sure it’s not canonical (i.e. that it’s not from the Buddhist scriptures) just on the basis of the language. Clearly, harboring resentments is seen here as a kind of mental burden, but the suspect quote isn’t close enough to be even a bad paraphrase. Hopefully more information about this quote will come to light in due course. I’d never come across this one until someone called Upul, from Australia, asked me about it. It certainly strikes me as being fake, on the grounds that the language of “a peculiar organism” isn’t something he would have said. But it may be based on something canonical, or be an amalgamation of commentary and a genuine quotation. It’s all over the place, once you look for it. I came across this one in the feed of someone who started following me on Twitter. Here’s a link to the original status update. This of course bears no resemblance to anything the Buddha’s recorded as having said. 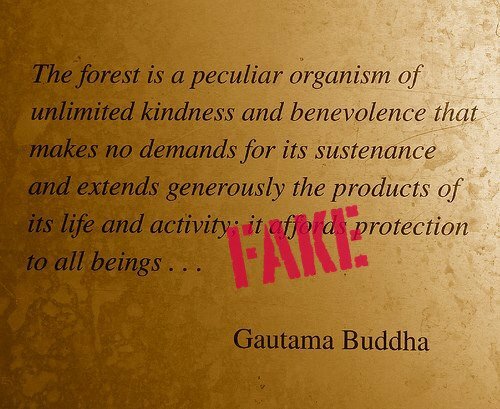 With some Fake Buddha Quotes it’s possible to trace the origins to a bad translation or some other obvious misattribution (for example a quote appears in a book called “The Teaching of the Buddha,” is subsequently quoted and attributed “The Teaching of the Buddha,” and is then requoted as attributed to “the Buddha”). But this one’s rather mysterious. The origins of this quote are slowly being pushed earlier in time. At first the earliest use of this quote I cold find was from a blog post from Nov 29, 2005. I then found an earlier example on a forum post dated November 30, 2004, as a signature. In 2007 it appears in a book, “A Year of Questions,” by Fiona Robyn, and (in a slightly different form) in “Hell in the Hallway,” by Sandi Bachom. This of course lends the quote a false air of legitimacy, and it’s now found in most of the quite appalling quotes sites that litter the web. If you come across any references to this quote earlier than November 2001, please let me know. That sounds like a good candidate for the origins of this quote. It’s certainly possible that someone paraphrased Longchenpa’s saying, and that this was first described as a “Buddhist” quote, which was then taken to be a quote from the Buddha himself. 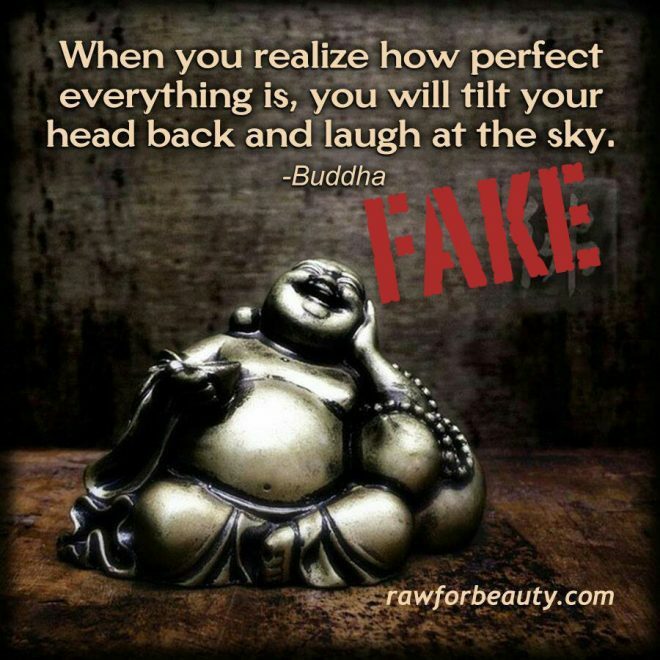 Some readers will recognize an added irony in the image above, which is not even of the Buddha. The graphic is akin to a quote being attributed to Jesus when it’s actually by Duns Scotus, and illustrated with a picture of Santa Claus. There’s more info on this happy chappie here.